Today I will provide my first general review of the data collected for William Kanistanaux. I need to assess what is known and what is missing for this family member. This will assist me in planning my next phase of research. 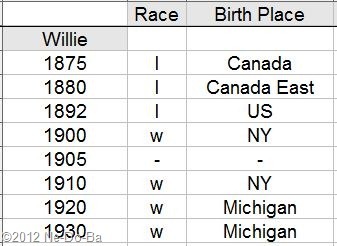 I was able to follow William out west in census records to Colorado and later to Utah. However, much of the information I have collected is conflicting and confusing. IT looks like the best place to start is locating the record of his first marriage to Maude. He was in Stockton before and after the marriage, so chances are very good he married there. He was single in the 1892 State census and his first child was born about Nov-1893. This suggests an 1892 or early 1893 marriage. I can search for his marriage record to his second wife in Evergreen, Jefferson Co., Colorado. She was born in Colorado so he probably met her after he left New York. However, he may not have gone directly to Evergreen, so locating a marriage record there may not happen. He died sometime after the 1930 Census. However, I have no idea where he died. An obvious place to start is So. Ashley, Uintah Co., Utah where he was living in 1930. But he has been on the move for the past 3 decades and he is still young enough to continue moving. Unsourced online trees have his death in 1950 in Vernal, Uintah Co., Utah, so I should look there first for his death record. I really don’t anticipate William’s later records (such as his 2nd marriage or his death) to contain accurate information about him. His combined census record data suggest a man who is not sure who he is or a man who is trying to hide who he is. His second family may not have known the truth and William himself may not have known the truth. I will attempt to locate these later records, but I will not spend much time and certainly will not spend money at this point in the project. Eventually it may become important to revisit this decision. While living with his presumed parents, he is identified as Indian in census records. Once he is away from home he is listed as white. This may be of value or it may simply be the perception of the census takers. His birth place is literally “all over the map”. Take your pick; Canada, New York, or Michigan. I think he is guessing, but then again, Michigan could be real and an important clue. William is the only one of the Kanistanaux children that could be the child of any one of the older generation. Marleah and Laton are also old enough to be his grandparents. At this point I think it will take a great deal of research and a good dose of luck to root out the true identity of this man. Online message boards provide a very interesting story for William’s origins, but I have yet to see any proof of what they claim. I should not allow these message boards to dictate how and where to research this man. I could miss important clues about other possibilities. Good research depends on not having preconceived notions about the people being researched. I need to continue with my style of research (find historical documents and let them lead me to the next step) and see where it goes. If I find that William must be properly identified in order to meet the goal of this research project, then I can revisit the message boards and work to prove their theory. The 1900 Census shows William in Stockton and suggests he is a land owner. At that time he had a wife and four young children. He left this family behind and moved west sometime between 1900 and about 1904 when he took his 2nd wife. There should be divorce records and perhaps guardianship papers for his children. I should also look for land records. It is always possible he received the land from a relative.